2 of 5 Dredge potato pancakes in flour and place on a plate. Refrigerate for at least 1 hour. 3 of 5 Combine jam and mustard. Set aside. Season pork chops with salt and pepper. Place on prepared pan and broil 4 inches from heat for 3 minutes per side or until temperature reaches 145 degrees . Evenly spoon jam mixture over each chop and scatter almonds over top. Broil for 45 to 60 seconds, until nuts are lightly browned. 4 of 5 Meanwhile, heat a large nonstick skillet over medium-high heat. Add oil and swirl around. Place potato pancakes in skillet and cook for 5 minutes. Carefully turn over with a spatula and cook for an additional 5 minutes. 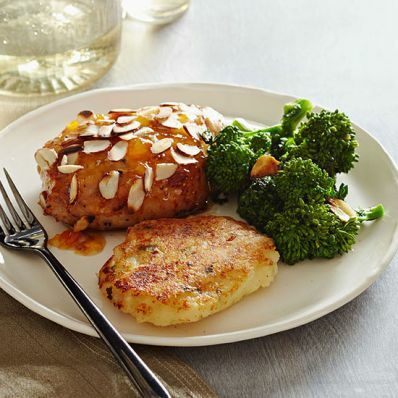 5 of 5 Serve pork and potato pancakes with sauteed broccoli or broccoli rabe, if desired. 1 of 1 Heat 1 tbsp olive oil in a large nonstick skillet over medium heat; add 3 sliced garlic cloves and cook 1 minute. Add 1 large bunch rinsed broccoli cut into florets and season with 1/4 tsp salt. Cook for 5 minutes, stirring occasionally. Per Serving: 582 mg sodium, 6 g sat. fat, 34 g carb., 3 g fiber, 26 g pro., 410 kcal cal., 19 g Fat, total, 71 mg chol.